We now have both Jelani's registrations and demo videos of his performances on the Virginia Virtual TPO running in Hauptwerk 2 available for download at the Milan Digital Audio website. I have both the Milan Digital Audio 2/8 Virginia WurliTzer version 1 sample set for Hauptwerk 2 and Jim Henry's 3/19 Mighty MidiTzer 260SP set up on my home organ/PC system. However, I have only two-channel (stereo) audio. Here are my comparisons between the two virtual organs. In brief, I actually prefer the sounds from Jim's MidiTzer 260SP over those from the 2/8 Virginia WurliTzer sample set for Hauptwerk 2. Why? I have on order the 2/8 Virginia WurliTzer version 2 sample set for Hauptwerk 2. Maybe I will hear Jelani's sounds when I have received that upgrade in another 10 days or so. This is using no more than the same rank count when trying the 3/19 MidiTzer 260SP verses the 2/8 Virginia WurliTzer in Hauptwerk 2. Of course the 260SP has 19 ranks, so it would not be fair to attempt to compare the two organs using all those ranks. So, I stayed with the same ranks, or at least as close as I could. The 2/8 Virginia WurliTzer had an Open Diapason, while the 2/10 Mighty WurliTzer Style 216, which Bruce Miles emulates with his soundfont for MidiTzer, has a Diaphonic Diapason. But in other ranks, I believe, "stock" WurliTzer pipes were used. I really don't know. I cannot achieve the "same" sound effect as is demo'd at the Milan Digital Audio website for Jelani's playing. And that is probably because those demo's are taken by adding impulse/convolution reverberation to each of 16 separate audio channels, then mixed down to the two stereo channels we hear at the demo recording site! Somehow, having each of the 8 pipe ranks reproduce to its' own stereo audio channel, including separate audio amplifiers and speakers for each rank of pipes, is providing a superior sound to that which I can do here at home. But, I do get a very satisfying sound when I register the MidiTzer 260SP exactly with Jelani's registrations! It seems more clear, or brighter - just not sure. Recalling back a few decades ago to the peak of the Hi-Fi home music reproduction craze of those years, I would say the MidiTzer 260SP, using Bruce's soundfonts, has more "presence" or clarity in the treble frquencies. And Jim's MidiTzer 260SP uses only two channel stereo audio output, or at least that is all I am using. Maybe to get the Jelani sound, I will have to buy two new E-mu eight stereo channel audio output sound cards and route each pipe rank to its' own stereo amp/speaker channel. Brett spread the eight ranks to 16 channels by allowing each rank to be done in stereo. No idea at this point how I would get individual reverb to each of those many audio channels, as Milan Digital Audio has done with the 2/8 Virginia WurliTzer demo's. Note that the audio in the demo's was not recorded "real time". Impulse reverb was added later as was, of course, the stereo mix down to the two channels we hear in the demo tracks. A Christmas Song From The Mighty Skinner! in Chicago, Illinois is one of the few Skinner organs that remains in nearly all of its original state. This photo curtisy of Milan Digital Audio, providers of Hauptwerk sample sets. Here is a recording for the Holidays, entitled Gotch Varon Adeste. 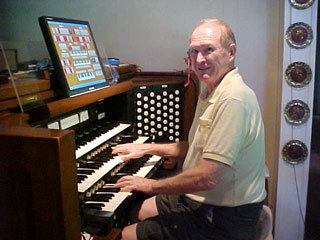 It was played on a Hauptwerk 2 Virtual Pipe Organ. 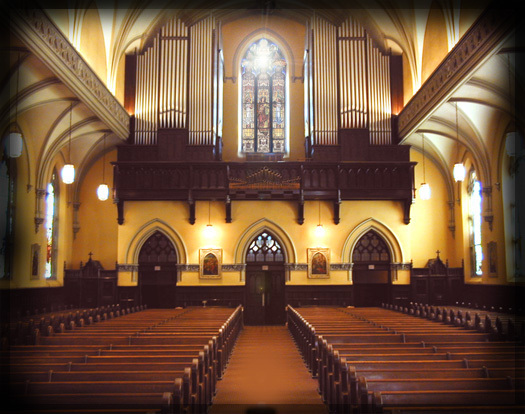 The Sample Set used was one made from a large Skinner Church Pipe Organ in Chicago, Illanois. The samples are by Brett Milan of Milan Digital Audio, who also brought us the 2/8 Mighty Virginia WurliTzer, and will soon be releasing a many, many stop Virtual theatre Pipe Organ in the days ahead. Watch your speaker setup with this demo! Believe me, every stop of this large instrument is used from time to time. This organ was built in 1928 by E. M. Skinner who had claims to have developed more orchestral voices for the pipe organ than perhaps even Hope Jones!! Yes, the music -romantic and modern- played by a true symphonic orchestral organ. That was what Skinner's goal was. This instrument was built in almost the exact middle of Skinner's great correspondence/collaboration with Henry Willis; they wrote long and frequent letters to one another for a period of years. Skinner even sending examples of various orchestral voice pipes to Willis, e.g. his French Horn; and Willis would reciprocate. Skinner was very pleased with this particular Chicago instrument, though installed in a church, not a concert hall. These symphonic organs were being built, obviously concurrently with the great output to movie theatres by WurliTzer, except the symphonic organs were going into town halls, concert places, etc., and some into very large churches. Skinner and his symphonic organs went "out of style" about the same time and to the same fate as WurliTzer and the theatre organ builders. Skinner was greatly impacted at the end of WW2 by the huge surge of interest among pipe organ folks in capturing and building/installing in the US the neo-baroque organs heard by the GIs interested in such things while they were over in Europe. But the above is a perfect example of the symphonic/orchestral pipe organ, which might even be on the way to a return, given what has happened at Disney Hall in Los Angeles, and in Philadelphia, Boston, etc. Only time will tell. Maybe these new symphonic organs will find a need for Tibias and heavier/deeper tremulants!! What do you suppose are the chances of a sample set being taken of the Rosales organ in Disney Hall? ?